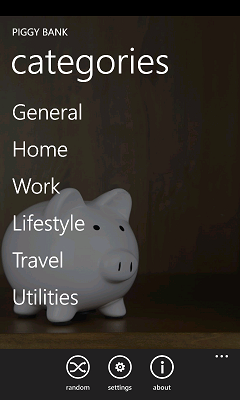 I recently started working on creating mobile phone apps for Windows Phone 7. Being majorly inclined towards .NET, I guess it was the natural thing to do. But more than that, I guess it was luck or pre-destined. I wanted to write mobile applications since the days of iPhone. But couldn’t afford a Mac so that was outta question. Then came Android, but with the pathetic state of the development tools, I decided to steer clear of it. And when Windows Phone 7 launched, I had met my match. Windows Phone 7 is sleek, cool, vivid & alive. Its been said over and over again, so I wont go in to a review of Windows Phone but let me introduce you to my first application for Windows Phone 7. Its a simple applications which provides you with gallery of simple tips to save money in regular day to day life. You can browse the tips category wise or just let the system do the work for you and read them randomly. This entry was posted by Mohib on February 28, 2012 at 7:20 pm, and is filed under AllienSoft Projects. Follow any responses to this post through RSS 2.0.You can leave a response or trackback from your own site. The Windows Phone 7 is truly a better pdrcuot. I owed an iPhone for 3 years and WP7 and the HTC Titian device is a far better user experience then the iPhone. iPhone is well advertised that’s why everyone wants them so bad.